Aria Denver is a new north of Highland neighborhood intentionally designed to cultivate life by providing a well-designed community that reduces your carbon footprint, provides urban agriculture and supports continued education within one block of Regis University. Here the neighbors support each other and want to be engaged in their neighborhood. They share resources, open spaces and access to community gardens. In Aria Denver, neighbors are more than just neighbors. They are friends, co-workers and a support system unlikely to be found in any other place. 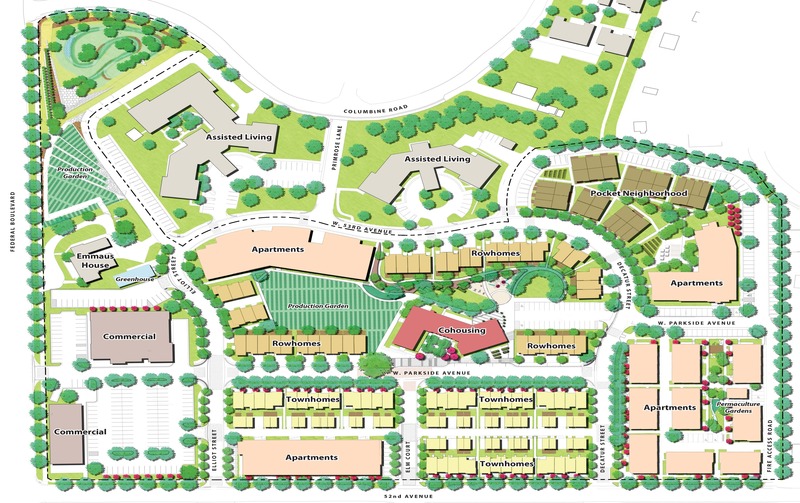 Located eight minutes from downtown Denver, this 17.5 acre site will feature a variety of green housing options – from rental apartments to for-sale townhomes to cohousing units. It will be be a diverse and intergenerational community, a place where people of all ages and interests can find their place.